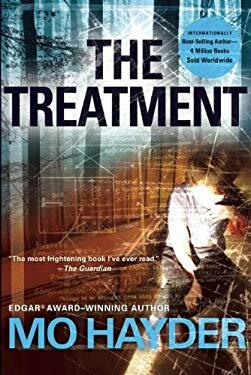 Hayder s second novel after the hair-raising "Birdman," "The Treatment" brings Detective Jack Caffery back to investigate the abduction of a little boy, a crime with disturbing parallels to Caffery's own troubled past. In a quiet residential area in London, a couple is discovered bound and imprisoned in their own home. Savagely battered and severely dehydrated, the worst revelation is yet to come: their eight-year-old son has been abducted. But when the body is found and forensic evidence turns the case on its head, revealing disturbing parallels to events in Detective Caffery's own past, he realizes he's dealing with much more sinister forces than he'd anticipatedand finds it increasingly difficult to maintain his professional distance. As the evidence mounts and Caffery struggles to hold his own life together, the case hurtles toward a shocking conclusion." Used Good (1 available) Former Library book. Shows some signs of wear, and may have some markings on the inside. 100% Money Back Guarantee. Your purchase also supports literacy charities. New (4 available) BRAND NEW. Over 1.5 million happy customers. 100% money-back guarantee. Make your purchase count: support Better World Books' worldwide literacy partners.